Kansas City, MO, held its municipal elections earlier this week. A number of important initiatives were approved by significant margins, all geared toward investing in the city and improving our community. Almost all of the bonds involved tax increases, but Kansas City voters took up the challenge with a resounding YES, putting infrastructure improvements, inner city investment, and even an animal shelter over their personal pocket books. Especially noteworthy was the record turnout: twice the number of voters as is usually expected at a municipal election this time of year. Maybe I’m reading too much into things, but I can’t help but hope this is a small sign of a greater groundswell. I, for one, have sworn never to miss another local or state election for the rest of my life. Judging from the chatter on FB and the turnout at Kansas City’s polls this past Tuesday, I may not be the only one. This reaffirmation of community commitment was especially refreshing in the middle of what, on a national level, has been a more bleak and divisive political climate. At least I can rest assured that in my home town, we’ve got each other’s backs. And we’re ready to vote to prove it. In other good news, Daughter of Aithne is now available for pre-order in both paperback and Kindle editions! I’ve been working hard prepping materials for a Bewitching Book Tour and Goddess Fish Book Blast, both of which begin on the release date, May 1. I suspect this review is connected to one of my book tours, though I’m not sure which one. If you’d like to read the whole thing on Goodreads, click here. That’s all the news for now. Hard to believe I’ve got less than a month to go before the third book of The Silver Web hits the market! It’s been a long and arduous journey, but well worth it. 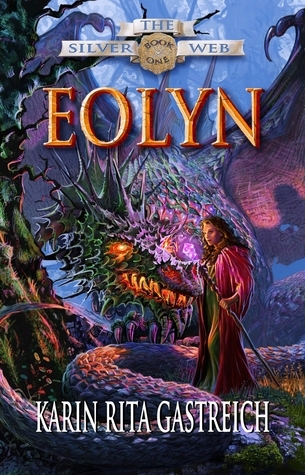 The Goodreads Giveaway for EOLYN, Book One of The Silver Web, is ongoing. Five signed copies are up for grabs. You can enter the giveaway by visiting Goodreads, or click the link below. The giveaway ends on April 16. Giveaway ends April 16, 2017. First–this is exactly what I was talking about on FB–the positive we have to pull from the negative of this past election. Awesome. Second–I pre-ordered DoA, and I got notification yesterday that it’s being shipped! And, as a matter of fact, is out for delivery and will arrive TODAY! I was really surprised. I’ll take a pic!